Our bodies are made up of millions of cells. 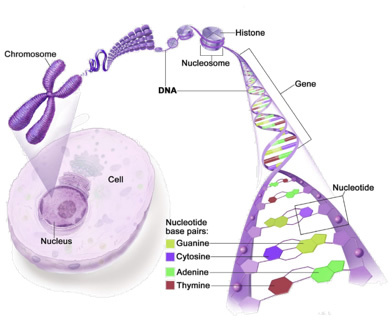 Within the nucleus of each cell there is a complete copy of our genetic code contained within the chromosomes. There are 46 chromosomes arranged in pairs so that a baby has a unique combinations of genes contained within the 23 chromosomes that come from the mother’s egg and the 23 chromosomes that come from the father’s sperm. The chromosomes contain long strands of DNA (DeoxyriboNucleic Acid) which are made up of four basic building blocks, Adenine (A), Guanine (G), Thymine (T) and Cytosine (C). Our DNA code is made up of a combination of three of these four chemical letters called a triplet. Each three letter word (triplet) tells the cell how to produce a specific amino acid. Our genes are chains of these triplet words and vary in size from a few hundred DNA words to more than 2 million and they act as the instructions to enable the cells to use the amino acid building blocks to make proteins. The Human Genome Project has estimated that humans have between 20,000 and 25,000 genes. The genes can be damaged and sometimes the damage is so great that the instructions to the cell do not make sense. The damage results in changes called “mutations.” Mutations may be small spelling mistakes in the words (triplet) where one of the three letters, (A, G, C or T) can be missing (a deletion) or added (an insertion), or a larger mistake where a string of words is missing. There are two forms of mutations, hereditary and acquired. Hereditary (or germline) mutations are inherited from a parent and are present throughout a person’s life in virtually every cell in the body. When an egg and a sperm cell unite, the resulting fertilized egg cell receives DNA from both parents. If this DNA has a mutation, the child that grows from the fertilized egg will have the mutation in each of his or her cells. Acquired (or somatic) mutations occur at some time during a person’s life and are present only in certain cells, not in every cell in the body. These changes can be caused by environmental factors such as ultraviolet radiation from the sun, or can occur if a mistake is made as DNA copies itself during cell division. Acquired mutations in somatic cells (cells other than sperm and egg cells) cannot be passed on to the next generation. Our genes contain all the information needed to ensure that all the different cells in our body can fulfill their specific functions. Some genes tell the cells how to fix damage accumulated over time from normal aging or as a result of smoking, alcohol, sun exposure or other toxins. These damage-controlling genes can repair cells or tell cells when to stop growing and die if there is too much damage to repair. When mutations occur in the damage-controlling genes, cells that are damaged cannot be repaired or killed and the cell becomes abnormal, continues to grow and divide into new abnormal cells. These abnormal cells that we call cancer cells can also invade (grow into) other tissues, something that normal cells cannot do. Cancer is a genetic disease—that is, cancer is caused by certain changes to genes that control the way our cells function, especially how they grow and divide, however the majority of cases, cancer is not an inherited disease. Inherited genetic mutations play a major role in about 5 to 10% of all cancers. Researchers have associated mutations in specific genes with more than 50 hereditary cancer syndromes, which are disorders that may predispose individuals to developing certain cancers. Even if a cancer-predisposing mutation is present in a family, not everyone who inherits the mutation will necessarily develop cancer. Breast cancer is common, affecting about 1 in 10 women in Ireland (National Cancer Registerty, 2017) at some point during their life, and almost half of all breast cancers are diagnosed in women over the age of 65 years. What are breast cancer genes? Some genes work to protect against cancer by correcting damage that can occur in the DNA during cell division. BRCA1 and BRCA2 are two examples of these tumour suppressor genes. The BRCA1/2 mutation does not cause cancer to occur on its own. The individual is at greater risk of developing cancer because their cells’ ability to repair DNA damage may be impaired by the BRCA1/2 mutation. It is the accumulation of DNA damage which causes a cell to change into a cancerous cell. We do not yet fully understand the whole process that changes a normal cell into a cancerous cell. We also do not yet understand why the BRCA1/2 mutations primarily give a high risk of breast, ovarian and prostate cancers, rather than other types of cancer. What does ‘dominant inheritance’ meant? You may have heard the term ‘dominant inheritance’ at your genetics appointment when the doctor or the counsellor was describing how the gene is passed down within the family. When we understand how a gene is passed down in a family we can then determine who is at risk of having the faulty gene within the family. A dominant condition is one where a person only needs one of the two gene loci to have a mutation, to be affected. In a BRCA carrier; having one faulty (mutated) copy is enough for someone to have the increased risk of developing breast, ovarian and prostate cancer, even though the other copy of the gene, which they inherited from their other parent, works normally. Therefore we know that if a person carries a BRCA mutation there is a 1 in 2 or 50% chance they will pass the faulty copy of the gene to their offspring; hence the 50% risk for children of BRCA carriers. We can also work out the risk to extended family by looking at how they are related to the BRCA carrier in the family. Who needs to know about the BRCA gene mutation? If you have had breast or ovarian cancer you may have been the first person in your family shown to carry the BRCA mutation and this news may come as a shock to your family. Perhaps you have had predictive testing and the presence of the mutation within your family has been known for some time. During your genetic counselling session the doctor or the genetic counsellor will go through your family tree with you to identify who is at risk of inheriting the faulty BRCA gene. Your close relatives (brothers, sisters and your children) will have a 50% chance of inheriting the faulty BRCA gene. In most families it will be easy to predict if the faulty BRCA gene came down through your mother’s or your father’s family because of the family history of cancer. The only way to prove this is to test family members to see who has the faulty gene. Only your relatives from that side of the family will have a risk of inheriting the faulty BRCA gene. Why do other people in my family need this information? Genetic information is different from most medical information an individual receives, because it is not only relevant to the individual but also to their family members. Genetic information can provide an explanation as to why someone has a particular health problem, but it also can predict future poor health or the risk of having a child affected with a particular genetic problem. If someone is aware that they have an increased risk of developing cancer, they have the chance to make choices about genetic testing, cancer surveillance or risk-reducing surgery. They may also decide to make changes to their lifestyle to help decrease their risk of developing cancer. Knowing about the risk gives your relatives a chance to take action to reduce their risk of getting cancer or help ensure that cancer is detected at an early stage so it may be treated more effectively. When should I share this information? There is probably no ‘right’ time to tell people. Sometimes families are aware of the testing process and are waiting to hear the results. Other people choose to wait until they know their results before they mention it to anyone else. There will be a variety of factors that affect your decision to share this news, for example you may need time to get used to the information first, or someone may have been bereaved recently and you may feel it is better to wait a bit. Sometimes people are too young to be told everything or maybe you are waiting until you have the chance to see someone in person rather than telling them over the telephone or by mail. 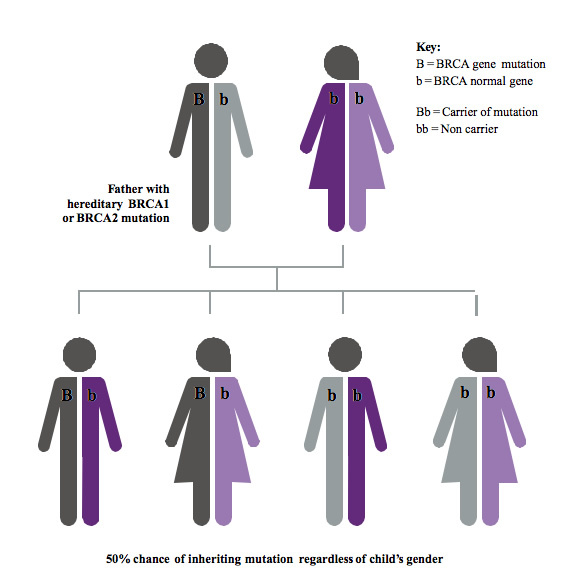 Having a BRCA gene mutation does not increase the risk of cancer in childhood so there is no advantage in doing genetic testing of BRCA mutations in children. Once a person is over 18 years old they can decide to proceed with genetic testing although in the majority of cases any women shown to carry a BRCA mutation will not need to even consider breast screening or risk reducing surgery until they are over 25 years old. Anyone in the family who has been affected with breast, prostate or ovarian cancer should be told as soon as possible because their doctors may need this information to make appropriate treatment decisions. How can I avoid upsetting my relative? Many people are concerned that sharing this information will cause their relative to feel very anxious or guilty and then feel responsible for causing this upset. It is always difficult to share ‘bad’ news. It might be useful to think of other times that you have had to share bad news, how you did it and what you learned from that experience. The knowledge of a BRCA mutation in a family will explain why there have been cancers in the family and gives your relatives an opportunity to choose to have testing and reduce their risks of cancer. It is important to remember that if someone has this BRCA gene mutation it is nobody’s fault – we cannot control which genes were passed on to our children. It is also important to remember that if someone has a faulty BRCA gene they have always had it since the moment they were conceived, so what is different now is that we can identify it and give people options to manage their risk. Does this faulty BRCA gene skip a generation? The faulty gene does not skip a generation. Not all individuals with a BRCA mutation will develop cancer (particularly men). For this reason, it may look as if the mutation has skipped but in reality it was present in the previous generation. Who is at risk of having the faulty BRCA gene in my family? If you are a BRCA mutation carrier, your close relatives have a 50/50 risk of having the faulty BRCA gene. The faulty gene would have been present in your family for many generations; it is not new within your family. It is only that we are now able to identify who actually carries the faulty gene. You would have inherited the BRCA gene from either your mother or your father. This faulty BRCA gene causes the increased risk of developing cancer. Your brothers and sisters each have a 50/50 risk of having the faulty BRCA gene. Each person would need to have genetic testing to determine if they have the faulty BRCA gene or not. You cannot predict if someone has the gene on the basis of their brothers’ or sisters’ genetic test results or if people look alike in the family. Your children (or future children) each have a 50/50 risk of having the faulty BRCA gene. We do not offer predictive testing to children because screening or risk-reducing treatment is not generally needed or available for children. Once they are over eighteen, each of your children could choose to have genetic testing to find out if they have inherited the faulty BRCA gene or not. The faulty BRCA gene would either have come down through your mother’s or your father’s family. So if you inherited the faulty BRCA gene from your mother, for example, then only your aunts, uncles and cousins on your mother’s side of the family are at risk of having the faulty BRCA gene. Is the faulty gene only important if you are a woman? Both men and women have BRCA1 and BRCA2 genes and therefore men can also carry BRCA gene mutations. It is less likely that men with a BRCA gene mutation will develop a cancer related to it but there is a 50% risk that they will pass on the mutation to each of their children. Statistics from the UK indicate that less than 1% of breast cancers occur in men but men who carry a BRCA mutation have an increased risk of male breast cancer. The lifetime risk of developing breast cancer is approximately 1% with BRCA1 mutations and 6% with BRCA2 mutations. In Ireland, about 1 in 7 men will get prostate cancer at some point in their lives. Mutations in BRCA1 and BRCA2 have been found in 0.44% and 1.2% prostate cancer cases respectively. A man with a BRCA1 mutation may be 3.4 times more likely to develop prostate cancer by age 65 than a man without this mutation. This may be 8.6 times more likely for a man with a BRCA2 mutation.